The tiny fur ball aliens that will eat anything or anyone set their sights on a Los Angeles apartment tower. After being cryogenically frozen and waking up on a space station in the near future, the Critters aim to have the unwitting crew for lunch. Q: When did the events of the movie take place? When was the movie filmed? This movie is one of the rare low-budget horror flicks that are actually good. The basic plot is that little furry monsters (kind of like hairy kirbys with teeth) land from outer space and begin to eat the town they land by. Pretty basic storyline, but this is a monster movie you know. The Critters (or Krites, to be precise), are, while obviously puppets, very cool and well done. The human actors on the other hand...well, they are terrible. The dad, his shoulder and leg practically gnawed of by critters, remains alert and vigilant, even though he's covered in blood. The boy is average, at best. The bounty hunters are alright. The best actor is Charlie, the drunk. He pulls off a very good performance. Ok, so this movie won't make any headlines, or be famous. 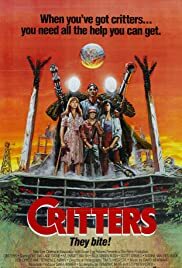 But if you are looking for a late night horror movie, with a dash or two of humor, Critters is a good choice!